Removing the view selector from a Sharepoint 2010 infopath form | Are you a user? If you have created custom InfoPath forms for a list in SharePoint 2010 and you have custom views for each of the New, Edit and View forms, you might find the InfoPath view selector showing up when you don’t want it to. This could allow users to change to the Edit view on your New item form, for example. 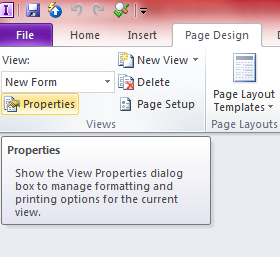 To fix this, you can select the View Properties from the Page Design menu in InfoPath and uncheck the “Show on the View menu when filling out the form” option. If all of your views have this unchecked, then the view selector will not appear on the SharePoint InfoPath form.